The Arab Revolt (Arabic: الثورة العربية‎, al-Thawra al-‘Arabiyya; Turkish: Arap İsyanı) or Great Arab Revolt (Arabic: الثورة العربية الكبرى‎, al-Thawra al-‘Arabiyya al-Kubrā) was a military uprising of Arab forces against the Ottoman Empire in the Middle Eastern theatre of World War I. On the basis of the McMahon–Hussein Correspondence, an agreement between the British government and Hussein bin Ali, Sharif of Mecca, the revolt was officially initiated at Mecca on June 10, 1916. [a] The aim of the revolt was the creation a single unified and independent Arab state stretching from Aleppo in Syria to Aden in Yemen, which the British had promised to recognize. It is estimated that the Arab forces involved in the revolt numbered around 5,000 soldiers. This number however probably applies to the Arab regulars who fought during the Sinai and Palestine Campaign with Allenby's Egyptian Expeditionary Force, and not the irregular forces under the direction of T.E. Lawrence and Faisal. On a few occasions, particularly during the final campaign into Syria, this number would grow significantly. Many Arabs joined the Revolt sporadically, often as a campaign was in progress or only when the fighting entered their home region. During the Aqaba raid, for instance, while the initial Arab force numbered only a few hundred, over a thousand more from local tribes joined them for the final assault on Aqaba. Estimates of Faisal's effective forces vary, but through most of 1918 at least, they may have numbered as high as 30,000 men. The Hashemite Army comprised two distinctive forces: tribal irregulars who waged a guerrilla war against the Ottoman Empire and the Sharifian Army, which was recruited from Ottoman Arab POWs, and fought in conventional battles. In the early days of the revolt, Faisal's forces were largely made up of Bedouin and other nomadic desert tribes, who were only loosely allied, loyal more to their respective tribes than the overall cause. The Bedouin would not fight unless paid in advance with gold coin, and by the end of 1916, the French had spent 1.25 million gold francs in subsidizing the revolt. By September 1918, the British were spending £220,000/month to subsidize the revolt. Faisal had hoped that he could convince Arab troops serving in the Ottoman Army to mutiny and join his cause, but the Ottoman government sent most of its Arab troops to the Western front-lines of the war, and thus only a handful of deserters actually joined the Arab forces until later in the campaign. The Hashemite forces were initially poorly equipped, but later were to receive significant supplies of weapons, most notably rifles and machine-guns from Britain and France. Ottoman troops in the Hejaz numbered 20,000 men by 1917. At the outbreak of the revolt in June 1916, the VII Corps of the 4th Ottoman Army was stationed in the Hejaz to be joined by the 58th Infantry Division commanded by Lieutenant-Colonel Ali Necib Pasha, the 1st Kuvvie- Mürettebe (Provisional Force) led by General Mehmed Cemal Pasha, which had the responsibility of safeguarding the Hejaz railroad and the Hicaz Kuvvei Seferiyesi (Expeditionary Force of the Hejaz) which was under the command of General Fakhri Pasha. In face of increasing attacks on the Hejaz railroad, the 2nd Kuvvie- Mürettebe was created by 1917. The Ottoman force included a number of Arab units who stayed loyal to the Sultan-Caliph and fought well against the Allies. [b] The Ottoman troops enjoyed an advantage over the Hashemite troops at first in that they were well supplied with modern German weapons. In addition, the Ottoman forces had the support of both the Ottoman air forces, air squadrons from Germany and the Ottoman gendarmerie. Moreover, the Ottomans relied upon the support of Ibn Rashid, the King of Ha'il whose tribesmen dominated what is now northern Saudi Arabia and tied down both the Hashemites and the Saud forces with the threat of their raiding attacks. The great weakness of the Ottoman forces was they were at the end of a long and tenuous supply line in the form of the Hejaz railroad, and because of their logistical weaknesses, were often forced to fight on the defensive. Ottoman offensives against the Hashemite forces more often faltered due to supply problems than to the actions of the enemy. The Sharif indicated that he could not break with the Ottomans immediately, and it did not happen till the following year. From July 14, 1915 to March 10, 1916, a total of ten letters, five from each side, were exchanged between Sir Henry McMahon and Sherif Hussein. Hussein's letter of 18 February 1916 appealed to McMahon for £50,000 in gold plus weapons, ammunition, and food. Feisal claimed that he was awaiting the arrival of 'not less than 100,000 people' for the planned revolt. McMahon's reply of 10 March 1916 confirmed British agreement to the requests and concluded the correspondence. Hussein, who until then had officially been on the Ottoman side, was now convinced that his assistance to the Triple Entente would be rewarded by an Arab empire encompassing the entire span between Egypt and Persia, with the exception of imperial possessions and interests in Kuwait, Aden, and the Syrian coast. He decided to join the Allied camp immediately, because of rumours that he would soon be deposed as Sharif of Mecca by the Ottoman government in favor of Sharif Ali Haidar, leader of the rival Zaid family. The much publicized executions of the Arab nationalist leaders in Damascus led Hussein to fear for his life if he were deposed in favour of Ali Haidar. Hussein had about 50,000 men under arms, but fewer than 10,000 had rifles. On June 5, 1916 two of Hussein's sons, the emirs ‘Ali and Faisal, began the revolt by attacking the Ottoman garrison in Medina, but were defeated by an aggressive Turkish defence led by Fakhri Pasha. The revolt proper began on June 10, 1916, when Hussein ordered his supporters to attack the Ottoman garrison in Mecca. In the Battle of Mecca, there ensued over a month of bloody street fighting between the out-numbered, but far better armed Ottoman troops and Hussein's tribesmen. The Hashemite forces in Mecca were joined by Egyptian troops sent by the British, who provided much needed artillery support, and finally took Mecca on July 9, 1916. The indiscriminate Ottoman artillery fire, which did much damage to Mecca, turned out to be a potent propaganda weapon for the Hashemites, who portrayed the Ottomans as desecrating Islam's most holy city. Also on June 10, another of Hussein's sons, the Emir Abdullah attacked Ta'if, which after an initial repulse settled down into a siege. With the Egyptian artillery support, Abdullah took Ta'if on September 22, 1916. French and British naval forces had cleared the Red Sea of Ottoman gunboats early in the war. The port of Jidda was attacked by 3500 Arabs on 10 June 1916 with the assistance of bombardment by British warships and seaplanes. The seaplane carrier HMS Ben-my-Chree provided crucial air support to the Hashemite forces. The Ottoman garrison surrendered on 16 June. By the end of September 1916 the Sharifian army had taken the coastal cities of Rabegh, Yenbo, Qunfida, and 6000 Ottoman prisoners with the assistance of the Royal Navy. The capture of the Red Sea ports allowed the British to send over a force of 700 Ottoman Arab POWs (who primarily came from what is now Iraq) who had decided to join the revolt led by Nuri as-Sa'id and a number of Muslim troops from French North Africa. Fifteen thousand well-armed Ottoman troops remained in the Hejaz. However, a direct attack on Medina in October resulted in a bloody repulse of the Arab forces. David Hogarth credited Gertrude Bell for much of the success of the Arab Revolt. She had travelled extensively in the Middle East since 1888, after graduating from Oxford with a First in Modern History. 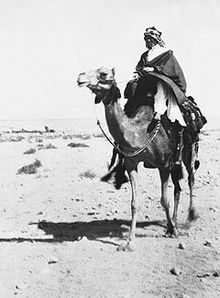 Bell had met Sheikh Harb of the Howeitat in January 1914 and thus was able to provide a "mass of information" which was crucial to the success of Lawrence's occupation of Aqaba covering the "tribal elements ranging between the Hejaz Railway and the Nefud, particularly about the Howeitat group." It was this information, Hogarth emphasized, which "Lawrence, relying on her reports, made signal use of in the Arab campaigns of 1917 and 1918." The year 1917 began well for the Hashemites when the Emir Abdullah and his Arab Eastern Army ambushed an Ottoman convoy led by Ashraf Bey in the desert, and captured £20,000 worth of gold coins that were intended to bribe the Bedouin into loyalty to the Sultan. Starting in early 1917, the Hashemite guerrillas began attacking the Hejaz railroad. At first, guerrilla forces commanded by officers from the Regular Army such as al-Misri, and by British officers such as Newcombe, Lieutenant Hornby and Major Herbert Garland focused their efforts on blowing up unguarded sections of the Hejaz railroad. Garland was the inventor of the so-called "Garland mine", which was used with much destructive force on the Hejaz railroad. In February 1917, Garland succeeded for the first time in destroying a moving locomotive with a mine of his own design. Around Medina, Captain Muhammand Ould Ali Raho of the French Military Mission carried out his first railroad demolition attack in February 1917. Captain Raho was to emerge as one of the leading destroyers of the Hejaz railroad. In March 1917, Lawrence led his first attack on the Hejaz railroad. Typical of such attacks were the one commanded out by Newcombe and Joyce who on the night of July 6/7, 1917 when they had planted over 500 charges on the Hejaz railroad, which all went off at about 2 am. In a raid in August 1917, Captain Raho led a force of Bedouin in destroying 5 kilometers of the Hejaz railroad and four bridges. 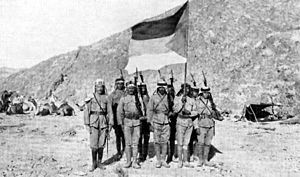 In March 1917, an Ottoman force joined by tribesmen from the Kingdom of Ha'il led by Ibn Rashid carried out a sweep of the Hejaz that did much damage to the Hashemite forces. However, the Ottoman failure to take Yanbu in December 1916 led to the increased strengthening of the Hashemite forces, and led to the Ottoman forces to assume the defensive. Lawrence was later to claim that the failure of the offensive against Yanbu was the turning point that ensured the ultimate defeat of the Ottomans in the Hejaz. In 1917, Lawrence arranged a joint action with the Arab irregulars and forces under Auda Abu Tayi (until then in the employ of the Ottomans) against the port city of Aqaba. This is now known as the Battle of Aqaba. Aqaba was the only remaining Ottoman port on the Red Sea and threatened the right flank of Britain's Egyptian Expeditionary Force defending Egypt and preparing to advance into Sanjak Maan of the Syria Vilayet. Capture of Aqaba would aid transfer of British supplies to the Arab revolt. Lawrence and Auda left Wedj on 9 May 1917 with a party of 40 men to recruit a mobile camel force from the Howeitat, a Syrian tribe renowned for fighting on camels. On 6 July, after an overland attack, Aqaba fell to those Arab forces with only a handful of casualties. Lawrence then rode 150 miles to Suez to arrange Royal Navy delivery of food and supplies for the 2500 Arabs and 700 Ottoman prisoners in Aqaba; soon the city was co-occupied by a large Anglo-French flotilla (including warships and sea planes), which helped the Arabs secure their hold on Aqaba. Even as the Hashemite armies advanced, they still encountered sometimes fierce opposition from local residents. In July 1917, residents of the town of Karak fought against the Hashemite forces and turned them back. Later in the year British intelligence reports suggested that most of the tribes in the region east of the Jordan River were "firmly in the Ottoman camp." The tribes feared repressions and losing the money they had received from the Ottomans for their loyalty. Later in the year, the Hashemite warriors made a series of small raids on Ottoman positions in support of British General Allenby's winter attack on the Gaza-Bersheeba defensive line which led to the Battle of Beersheba). Typical of such raids was one led by Lawrence in September 1917 that saw Lawrence destroy a Turkish rail convoy by blowing up the bridge it was crossing at Mudawwara and then ambushing the Turkish repair party. In November 1917, as aid to Allenby's offensive, Lawrence launched a deep-raiding party into the Yarmouk River valley, which failed to destroy the railroad bridge at Tel ash-Shehab, but which succeeded in ambushing and destroying the train of General Mehemd Cemal Pasha, the commander of the Ottoman VII Corps. Allenby's victories led directly to the British capture of Jerusalem just before Christmas 1917. In the spring of 1918, Operation Hedgehog, a concerted attempt to sever and destroy the Hejaz railroad, was launched. In May 1918, Hedgehog led to the destruction of 25 bridges of the Hejaz railroad. On 11 May Arab regulars captured Jerdun and 140 prisoners. Five weeks later, on 24 July Nos. 5 and 7 Companies of the Imperial Camel Corps Brigade commanded by Major R. V. Buxton, marched from the Suez Canal to arrive at Aqaba on 30 July, to attack the Mudawwara Station. 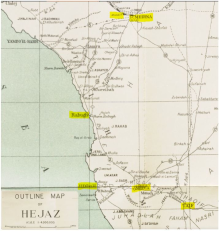 A particularly notable attack of Hedgehog was the storming on August 8, 1918, by the Imperial Camel Corps, closely supported by the Royal Air Force, of the well-defended Hejaz railroad station at Mudawwara. They captured 120 prisoners and two guns, suffering 17 casualties in the operation. Buxton's two companies of Imperial Camel Corps Brigade continued on towards Amman, where they hoped to destroy the main bridge. However 20 miles (32 km) from the city they were attacked by aircraft, forcing them to withdraw eventually back to Beersheba where they arrived on 6 September; a march of 700 miles (1,100 km) in 44 days. For the final Allied offensive intended to knock the Ottoman Empire out of the war, Allenby asked that Emir Faisal and his Arab Northern Army launch a series of attacks on the main Turkish forces from the east, which was intended to both tie down Ottoman troops and force Turkish commanders to worry about their security of their flanks in the Levant. Supporting the Emir Faisal's army of about 450 men from the Arab Regular Army were tribal contingents from the Rwalla, Bani Sakhr, Agyal, and Howeitat tribes. In addition, Faisal had a group of Gurkha troops, several British armored car squadrons, the Egyptian Camel Corps, a group of Algerian artillery men commanded by Captain Pisani and air support from the RAF to assist him. The United Kingdom agreed in the Hussein-McMahon Correspondence that it would support Arab independence if they revolted against the Ottomans. The two sides had different interpretations of this agreement. [clarification needed] In the event, the United Kingdom and France reneged on the original deal and divided up the area in ways that the Arabs felt were unfavourable to them under the 1916 Sykes-Picot Agreement. Further confusing the issue was the Balfour Declaration of 1917, which promised support for a Jewish "national home" in Palestine. For a brief period, the Hejaz region of western Arabia became a self-declared state — but have not been universally recognised as such — under Hussein's control. It was eventually conquered by Ibn Saud in 1925 as part of his military and socio-political campaign for the unification of Saudi Arabia. According to Efraim Karsh of Bar-Ilan University, Sharif Hussein of Mecca spent most of his life living in Constantinople, spoke better Turkish than he did Arabic, and until 1916 had been regarded by almost everyone as a loyal Ottoman official. Karsh called Hussein as "a man with grandiose ambitions" and had first started to fall out with his masters in Constantinople when the dictatorship comprising a triumvirate known as the Three Pashas, comprising General Enver Pasha, Talaat Pasha and Cemal Pasha representing the radical Turkish nationalist wing of the CUP seized power in a coup d'état in January 1913 and began to pursue a policy of centralization, which crimped Hussein's powerbase in the Hejaz more and more. Hussein started to embrace the language of Arab nationalism only after he began his revolt against the Ottoman government in June 1916, and even then Arab nationalism was one out of the many arguments that he used to advance claims to rule most of the Middle East, which were just as often justified by the need to hold together the Islamic Ummah. Hussein saw himself as the founder of a new empire, and looked down upon his fellow Ottoman Arabs as backward, ignorant people whom he was "destined" to rule. Though the Sharifian revolt has tended to be regarded as a revolt rooted in a secular Arab nationalist sentiment, the Sharif did not present it in those terms; rather, he accused the Young Turks of violating the sacred tenets of Islam and called Arab Muslims to sacred rebellion against the ostensibly "impious" Ottoman government. Contrarily, Turks as well as many Arab leaders accused rebelling tribes of betraying the Muslim caliphate during a campaign against imperialist powers which were trying to divide and govern the Muslim lands. William L. Cleveland of Simon Fraser University states that the revolt failed to generate significant support from within the Ottoman Empire's Arab provinces, and remained largely limited to tribal levies from the Arabian Peninsula loyal to Sharif Hussein. Efraim Karsh of Bar-Ilan University considers the term Arab Revolt as a misnomer as it implies that the majority of the Ottoman Arabs rebelled, when in fact the majority stayed loyal. According to Karsh, Arab nationalism was not yet a mass movement, even in Syria where it was strongest. Many Arabs gave their primary loyalty to their religion or sect, their tribe, or their own particular governments. The ideologies of Ottomanism and Pan-Islamism provided strong competition for Arab nationalism. The vast majority of the Arabs living in the Ottoman Empire were primarily loyal to their own families, clans, and tribes and in terms of broader loyalties, saw themselves as Muslims rather than as Arabs, which in practical terms meant support for the Ottoman Empire, whose sultan also claimed to be the caliph. Traditional Islamic theory preaches the message that all Muslims, regardless of their ethnicity or race, should live together in the Ummah, where usually been interpreted to mean one state, and for centuries Muslims living under Ottoman rule, whether they be Turks, Kurds, Arabs, Albanians, and so forth all saw themselves as united by a common religion and state. In the Ottoman Empire, Sunni Islam was the state religion, and the sultan-caliph was the supreme religious-political leader, thus making the crown and the faith one and the same. Before 1914, of the ten million or so Arabs living under Ottoman rule, only a mere 350 were involved in various feuding nationalist groups, most of whom wanted only autonomy rather than independence. ^ During the First World War, between 100, 000 and 300, 000 Arabs served in the Ottoman Army. ^ Mehmet Bahadir Dördüncü, Mecca-Medina: the Yıldız albums of Sultan Abdülhamid II, Tughra Books, 2006, ISBN 1-59784-054-8, page 29. Number refers only to those laying siege to Medina by the time it surrendered and does not account for Arab insurgents elsewhere. ^ Erickson 2001, p. 238, Appendix F.
^ Statistics of the Military Effort of the British Empire During the Great War 1914–1920, The War Office, p. 633: 8,000 prisoners taken by the Arab insurgents in Syria-Palestine in 1918, joining 98,600 taken by the British. ^ Süleyman Beyoğlu, The end broken point of Turkish - Arabian relations: The evacuation of Medine, Atatürk Atatürk Research Centre Journal (Number 78, Edition: XXVI, November 2010) (Turkish). 8,000 Ottoman troops surrendered at the end of the Siege of Medina and were evacuated to Egypt afterwards. ^ a b c d e f g Karsh, Efraim Islamic Imperialism, New Haven: Harvard University Press, 2006 page 128. ^ Yesilyurt, Nuri (2006). "Turning Point of Turkish Arab Relations:A Case Study on the Hijaz Revolt" (PDF). The Turkish Yearbook. XXXVII: 107–8. ^ Janet Wallach (1997) Desert Queen: The Extraordinary Life of Gertrude Bell Adventurer, Adviser to Kings, Ally of Lawrence of Arabia. London: Phoenix/Orion Books Ltd. ISBN 1400096197. pp. 25, 115–8, 202. ^ Rogan, Eugene (2011). The Arabs: A History. Penguin. p. 152. ^ Rogan Eugene (11 April 2002). 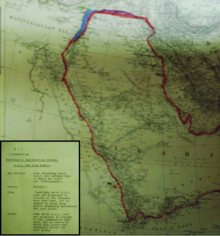 "Frontiers of the State in the Late Ottoman Empire: Transjordan, 1850-1921". Cambridge University Press. p. 233. Retrieved 1 June 2017. ^ Mikaberidze, Alexander (2011). Conflict and Conquest in the Islamic World: A Historical Encyclopedia, Volume 1. ABC-CLIO. pp. 799–802. ISBN 978-1598843361. ^ Karsh, Efraim Islamic Imperialism, New Haven: Harvard University Press, 2006 pages 128-129. ^ William L. Cleveland; Martin Bunton (2016). A History of the Modern Middle East (6 ed.). Westview Press. p. 150. Although clandestine support for the revolt existed in some parts of Syria, Husayn's call failed to generate any organized response in the Arabic-speaking provinces; indeed, many Arab public figures accused Husayn of being a traitor and condemned his actions as dividing the Ottoman-Islamic Empire at a time when unity was crucial. Rather than a popular uprising against the Ottoman Empire, the Arab Revolt was a more narrowly based enterprise relying on tribal levies from Arabia and dominated by the Hashimite family. Cleveland, William L. and Martin Bunton. (2016) A History of the Modern Middle East. 6th ed. Westview Press. Parnell, Charles L. (August 1979) CDR USN "Lawrence of Arabia's Debt to Seapower" United States Naval Institute Proceedings. Anderson, Scott (2014). Lawrence in Arabia: War, Deceit, Imperial Folly and the Making of the Modern Middle East. Atlantic Books. Oschenwald, William. 'Ironic Origins: Arab Nationalism in the Hijaz, 1882-1914' in The Origins of Arab Nationalism (1991), ed. Rashid Khalidi, pp. 189–203. Columbia University Press. Wilson, Mary C. 'The Hashemites, the Arab Revolt, and Arab Nationalism' in The Origins of Arab Nationalism (1991), ed. Rashid Khalidi, pp. 204–24. Columbia University Press.